Have you seen the sea disappear in front of your eyes? 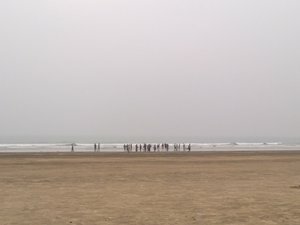 A unique phenomenon rarely seen anywhere else, the sea recedes by as much as five kilometres every day on the Chandipur beach in Balasore,Odisha(Eastern India), not just enthralling the onlooker but also offering an opportunity to literally walk into the sea. One of nature's many wonders, the sea recedes massively from the beach during ebb and returns to fill the emptiness during high tide. This hide-and-seek of the sea comes to play twice a day and seeing the sea disappear and then return is an unforgettable experience.2 km away is Balaramgadi where the river Budhabalang meets the sea. A trip through the mouth of the meandering river on a fisherman's boat is a pleasant experience. Watching them cast their nets and pull their catch of fish is memorable.